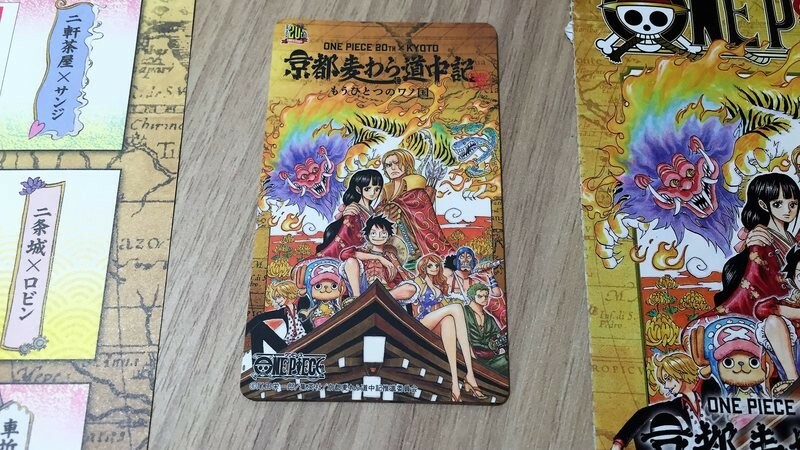 One Piece has come to Kyoto! 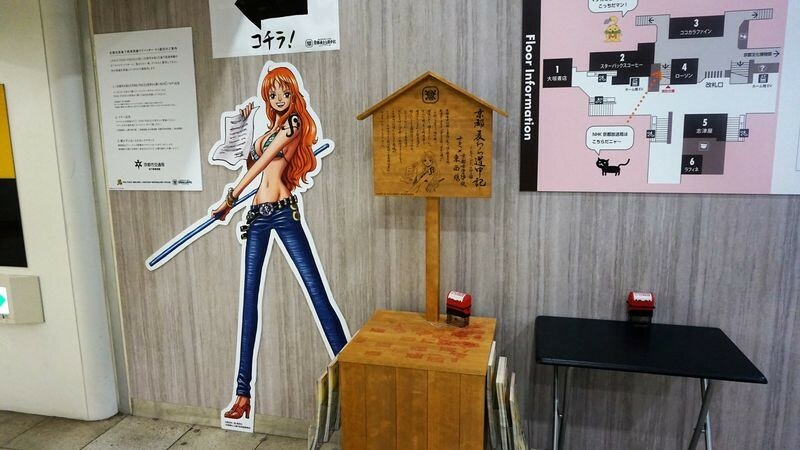 Luffy's at Kyoto Station, Nami at Karasuma Oike, and you can find Brook at Kurumazaki Shrine! 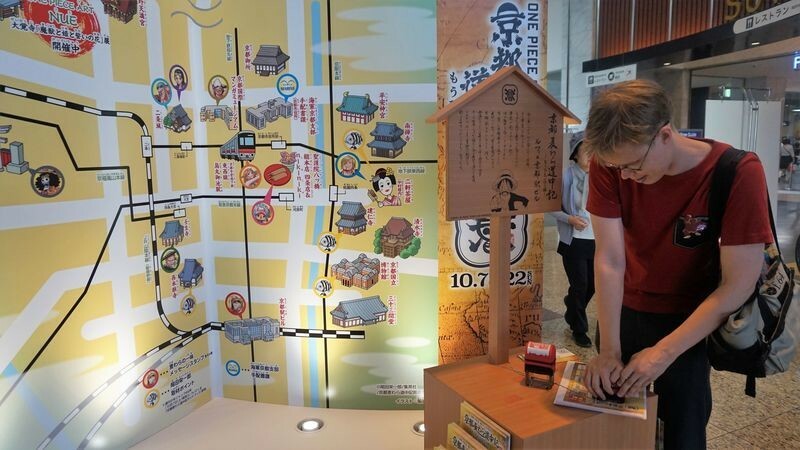 One Piece 20th x Kyoto: The Straw Hat Pirates Adventure into the Country of Wano is an event that’s taking place in Kyoto right now, and is going on until 22 October 2017. This event joins the traditional culture of Kyoto with the cutting edge straw hats of One Piece. 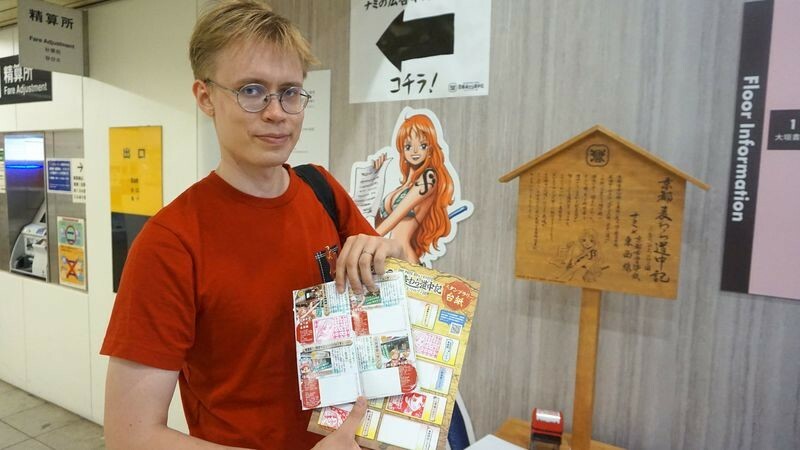 You get to see One Piece characters all over Kyoto, and there is a “stamp rally” where you get fabulous prices if you collect all of the stamps. Or just three, but then you don’t get the main price. So, we, of course, had to get all of the stamps. 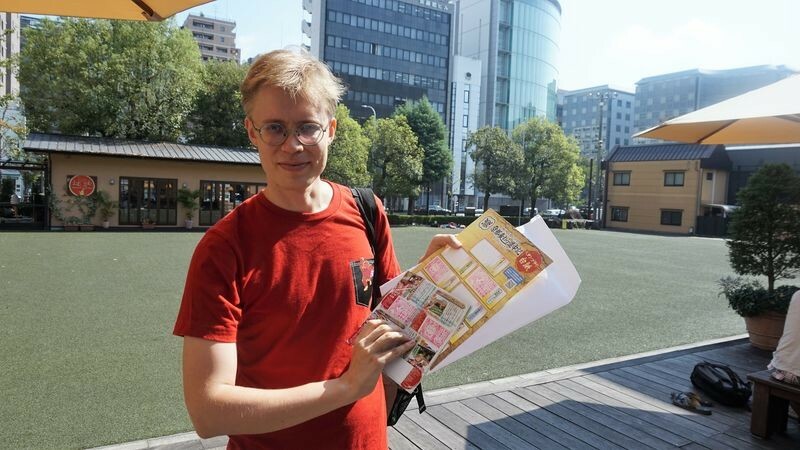 Kyoto City Hall is the starting point where you get your “Wanted Dead or Alive” posters, after which you can start going around Kyoto looking for Luffy and his friends. But if you are going to do this, don’t start here. The posters you get are cool and big, but you don’t need to come here as you can get the card you need to stamp at the places with the stamps. I recommend coming here only after you have gotten all the stamps, so you can get both your rewards and the Wanted Dead or Alive posters. 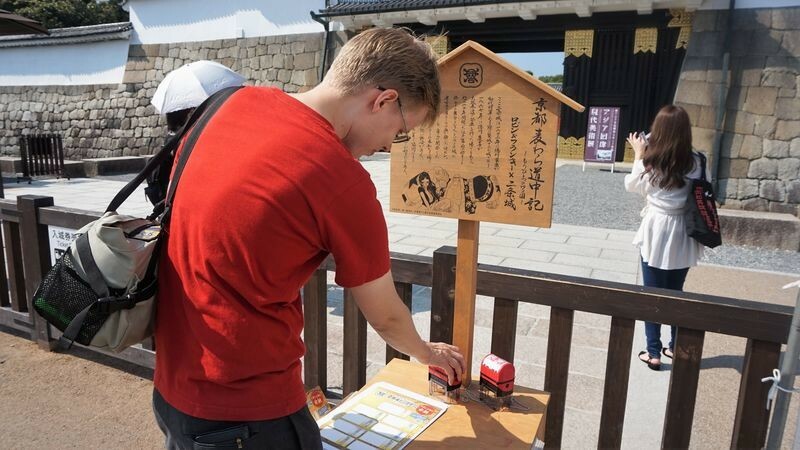 When doing this stamp rally, you should consider getting the one-day pass for Kyoto subway and Randen lines. 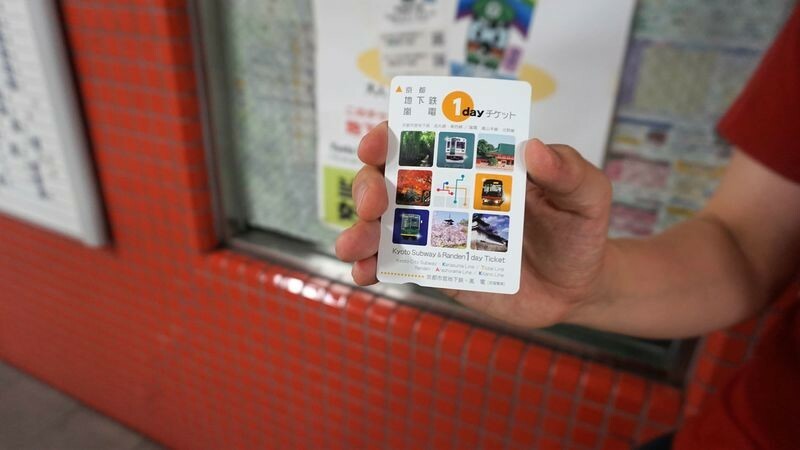 It’s only 1000 yen for a day, so if you are going to all the spots, it’s much cheaper by using this pass. The first place where we were actually going to get our cards stamped. Nijo Castle is a huge and beautiful place, but we had some trouble locating the place where you are supposed to stamp the card. They also had AR tours of the castle by none other than Robin herself. And after asking the staff, we found out that you don’t need to go inside the castle to get the stamp. The stamps are outside! Next we had Karasuma Oike Station, where Nami was doing the announcements. So now we had two stamps already, and the next stop was really close. 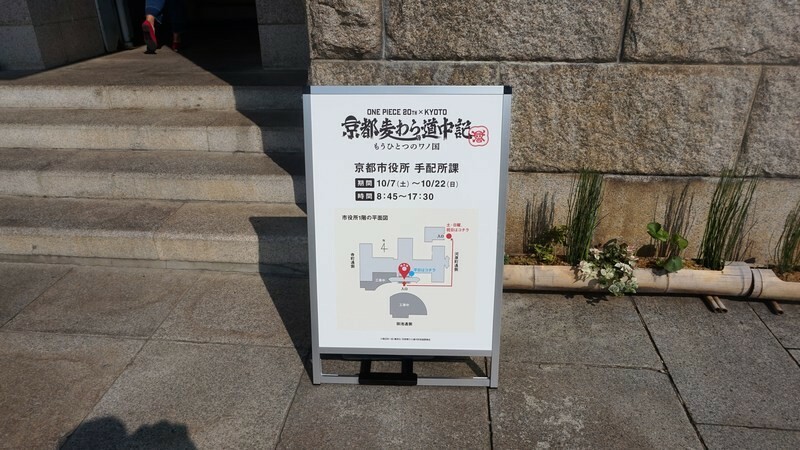 Next, Manga Museum, where you were unfortunately not allowed to take pictures at the stamping place. There’s a cool, huge picture of Usopp there though. And you have to pay to get in, so it would be nice to spend some more time here. 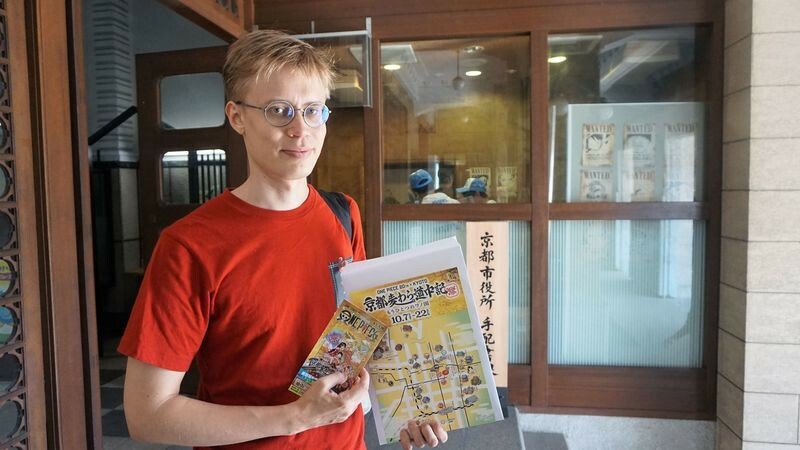 They have some very nice exhibitions, and there is an incredible amount of manga to read. They had a lot of English manga too, and some even in Thai! At Kyoto Station we got to meet Luffy himself! 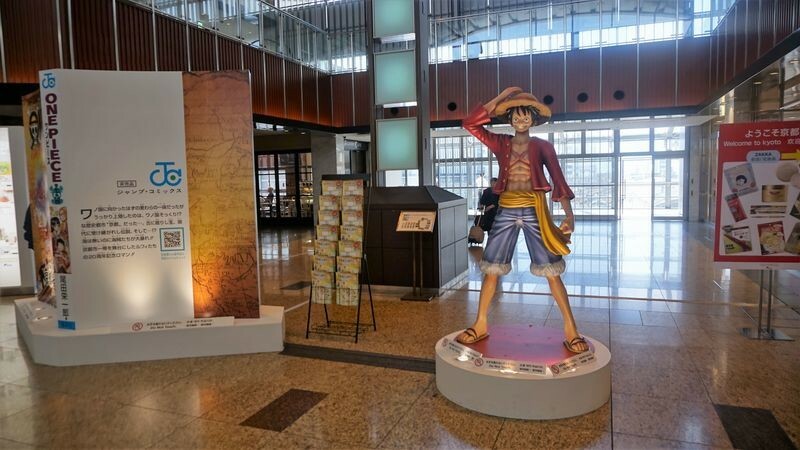 There’s a rather big statue of Luffy on display at Kyoto Station, near Toki no Akari, the clock tower. So we got our cards stamped and we’re on our way to the next spot. 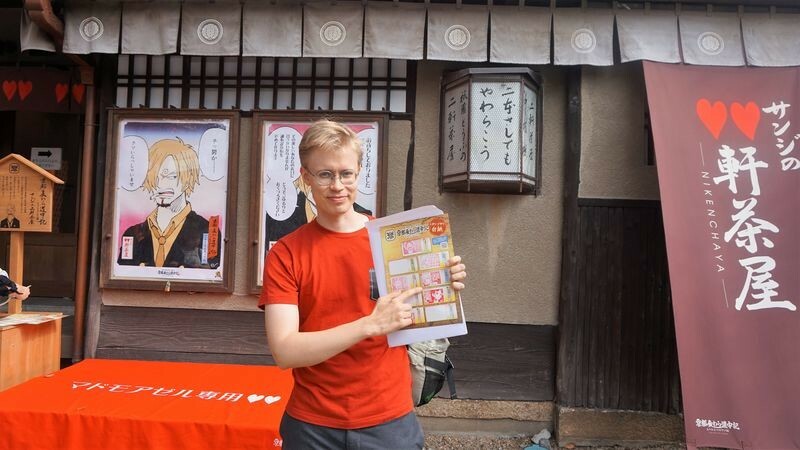 Nikenchaya is a restaurant with a history almost 500 years long, but right now the restaurant is covered with pictures of Sanji. Even the letter for two in their name is replaced by two hearts! 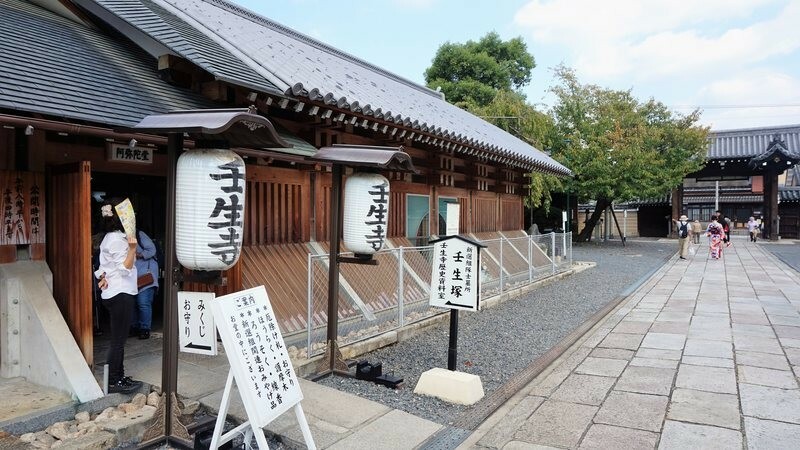 The restaurant is just next to Yasaka Shrine. 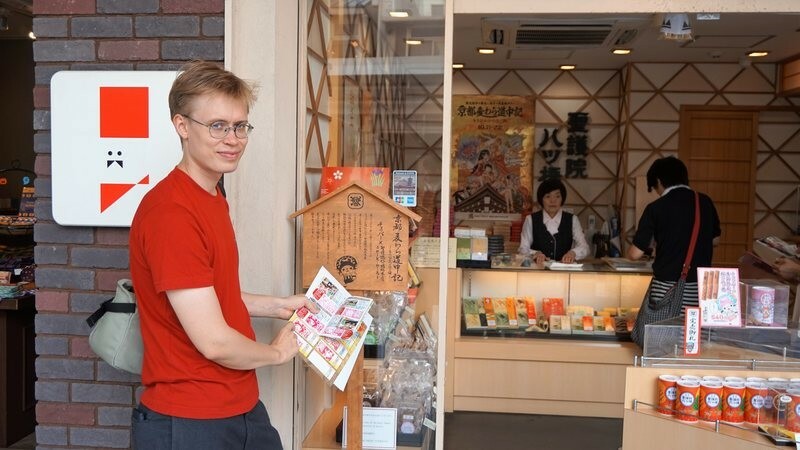 All their special “Sanji bentos” were sold out, so we just got a stamp and headed for the next place; a shop selling the Kyoto specialty yatsuhashi. 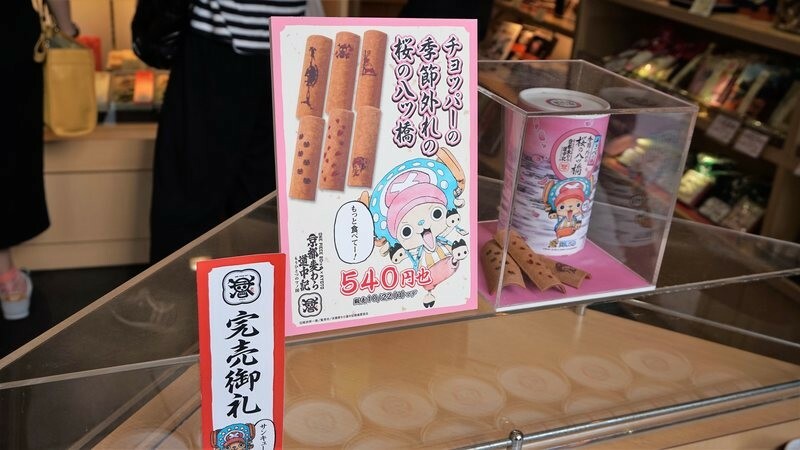 Chopper seems to like sweet things and especially yatsuhashi which are kind of like a Kyoto-version of cinnamon bread. The shop is located just next to Hankyu Kawaramachi Station. Unfortunately, they were also sold out, so we only got the stamp. If you also want Chopper yatsuhashi, you better go to this shop early. 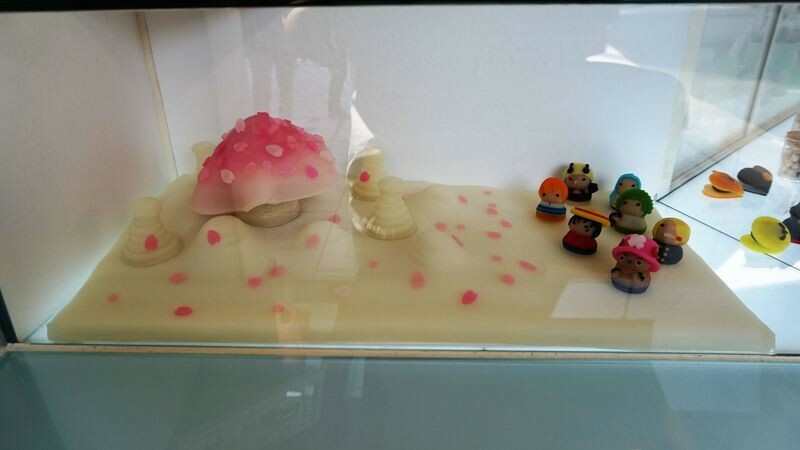 Their “sister-shop” next door also had One Piece themed artwork on display. 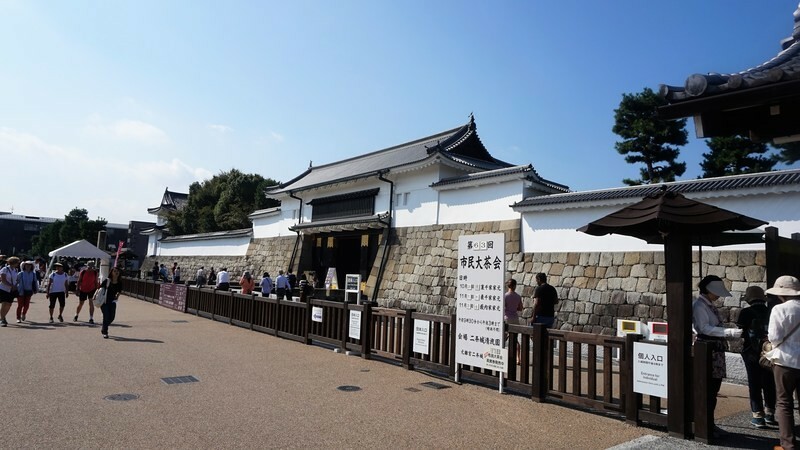 Mibu Temple is famous for having the graves of 11 members of Shinsengumi. 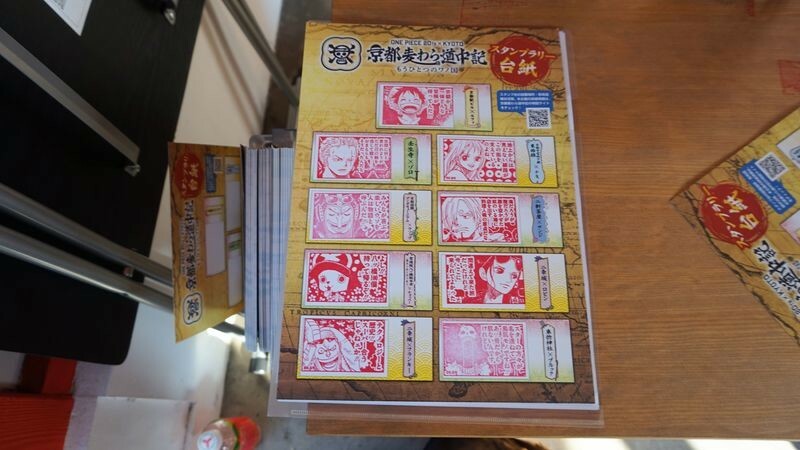 Which is probably the reason why Zoro is the character whose stamp you can get here. 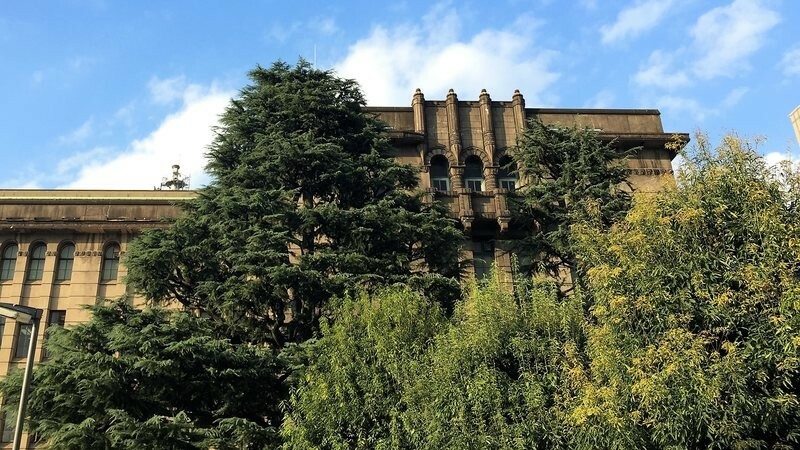 The temple is located not too far from Hankyu Omiya Station. 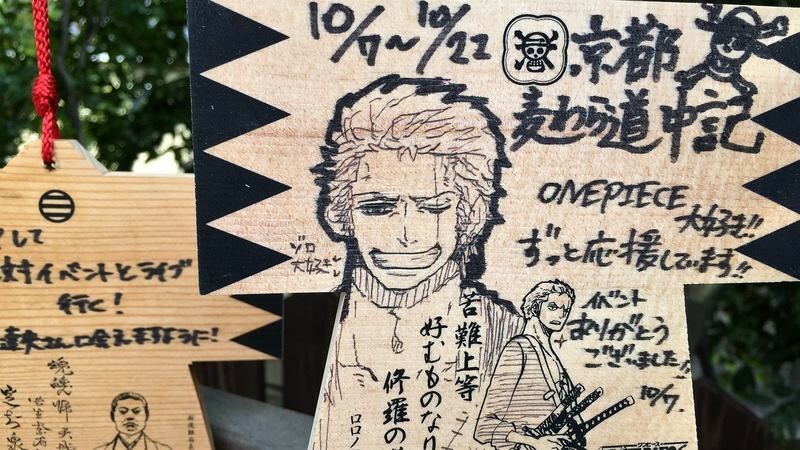 They also sell special wooden “ema” plaques with Zoro on them. Unfortunately, these were also sold out. So we got our stamp and headed for the final stop. 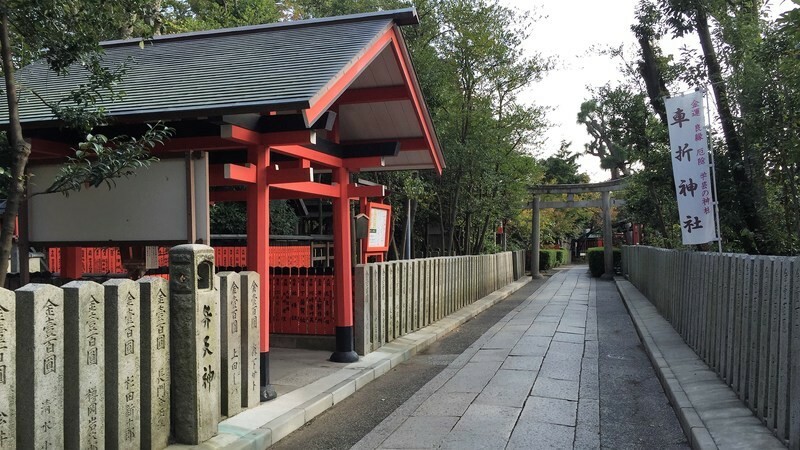 Kurumazaki Shrine is a shrine close to Arashiyama, and it has its own stop on the Randen line to Arashiyama. This means that it’s surprisingly easy to get to this shrine, even though it’s a bit far from the center of Kyoto. 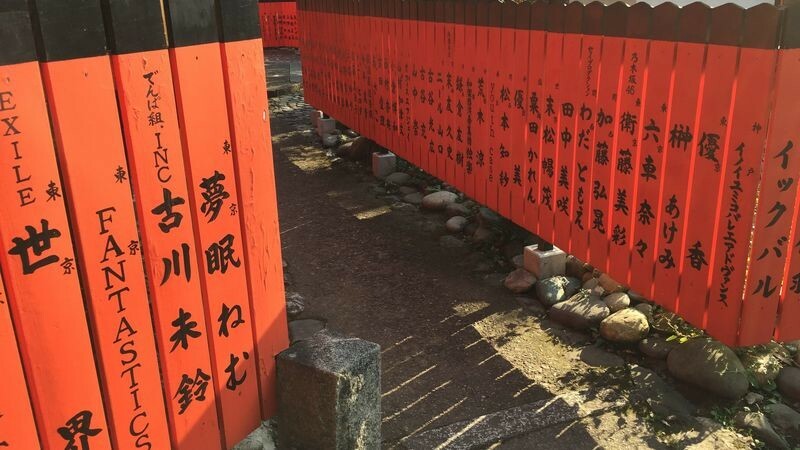 This shrine is the place to pray for artists, which is why you can see these wooden plaques left here by members of Denpagumi.inc, SKE 48, HKT 48, Nogisaka 46, Exile, and Sandaime J Soul Brothers. 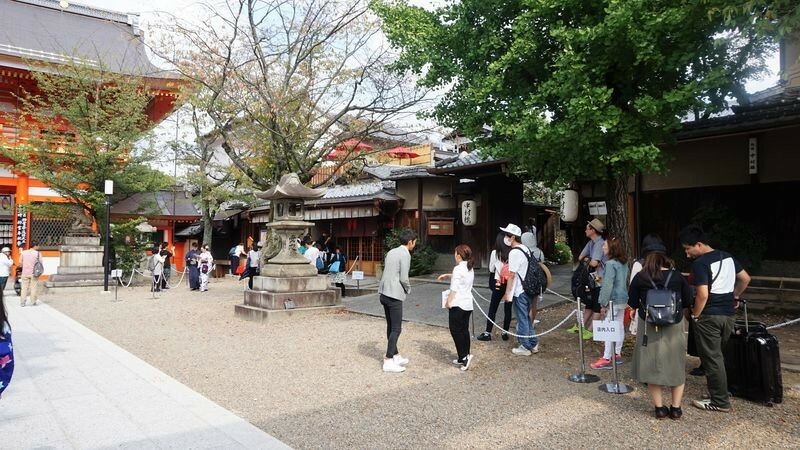 So for fans of those groups, this is the shrine to visit in Kyoto. For anime fans there is also a plaque by CLAMP. So voila – we have all the stamps! 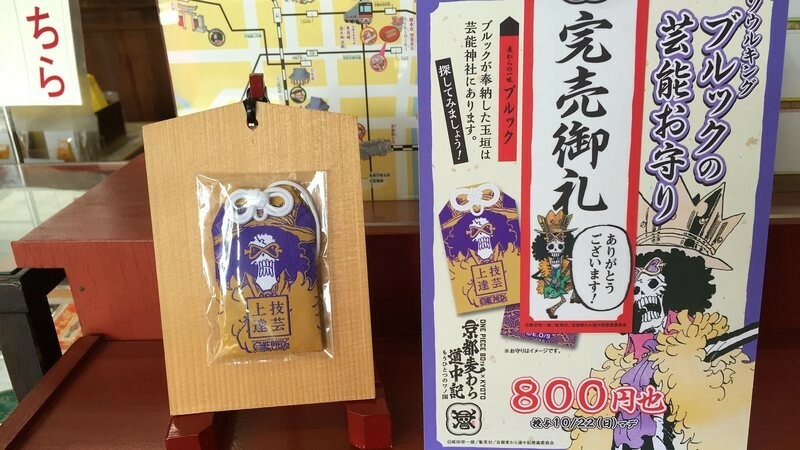 They also sell protective amulets with Brook on them, but these were sold out for the day. 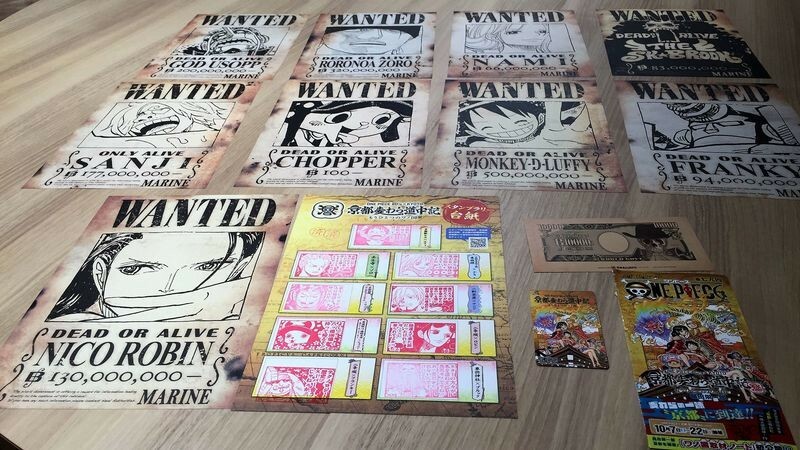 You have to go early if you want to get any of these One Piece items. So, it took us around half a day, something like six hours to get all of the stamps. 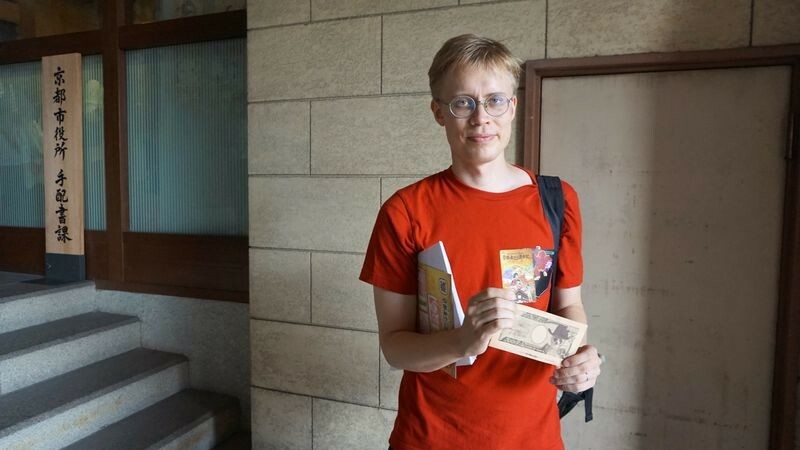 And for this, we got some One Piece money and a special message card from Eiichiro Oda. The card has a QR code through which you can access the message. So here I am holding the prices and looking very excited. So here is the loot we got for our adventure. Looking at all of it like this, it really was worth it. This event is something that is fun even for those that don’t know One Piece, but a must-go for fans of the series. 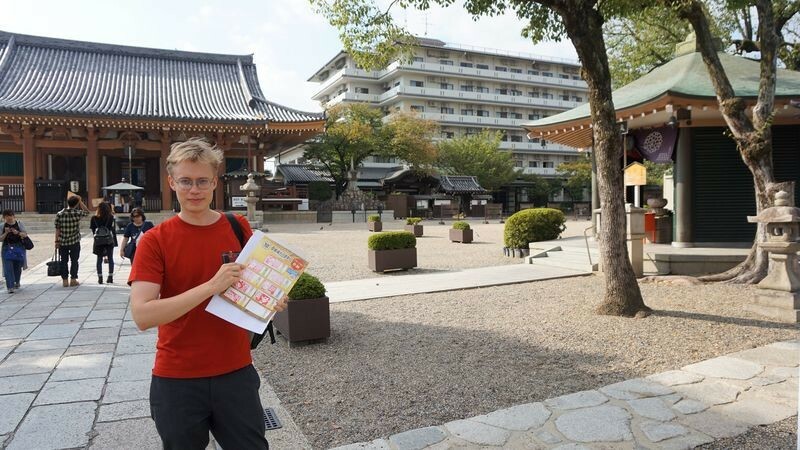 I really enjoyed traveling around Kyoto and seeing all these temples and traditional shops, and it was the most places I have been to in Kyoto in one day. 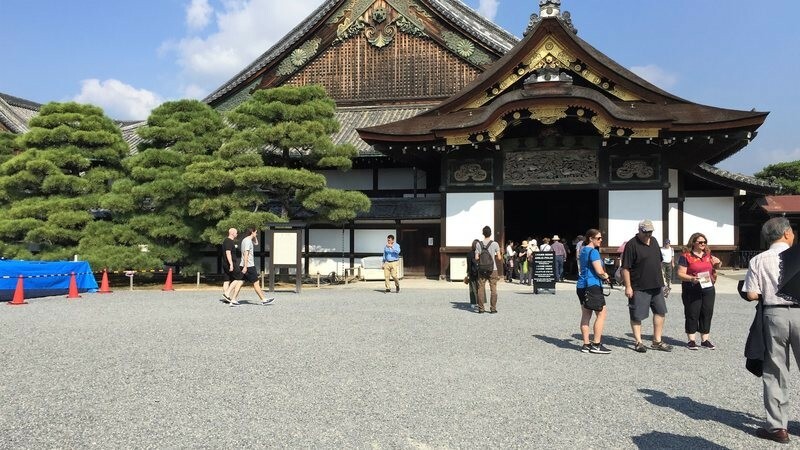 There’s a saying from the Edo period of Japan, “The best way to enjoy travel is to go to around 10 different places in a day” and here I have to say I think this is true. If you take part in this stamp rally, you really do get to see all kinds of places you normally wouldn’t go to.